If you smoke, or have friends who can't stop smoking even though they know it's a bad habit, you might understand the cribbing horse. An inveterate cribber will crib on anything he can get his teeth on. Over time, this vice causes tooth damage. If you have a cribber, have a licensed veterinarian float his teeth annually rather than rely on an equine "dentist" who lacks a veterinary degree. Horses crib for various reasons. There could be a genetic component, or the horse starts cribbing because he's bored, stressed or an unusually high-strung animal. Whatever the cause, the cribber grabs an object, often a stall door or fence rail, with his upper incisors, and he arches his neck and grunts while sucking air into his system. Cribbing isn't the same as wood chewing, as the horse isn't actually chewing but holding on to the fixed item as hard as he can with his teeth. Constant cribbing can cause damage to his stall or paddock. Mild cribbers might indulge only after a meal -- sort of like the person who smokes only after eating. 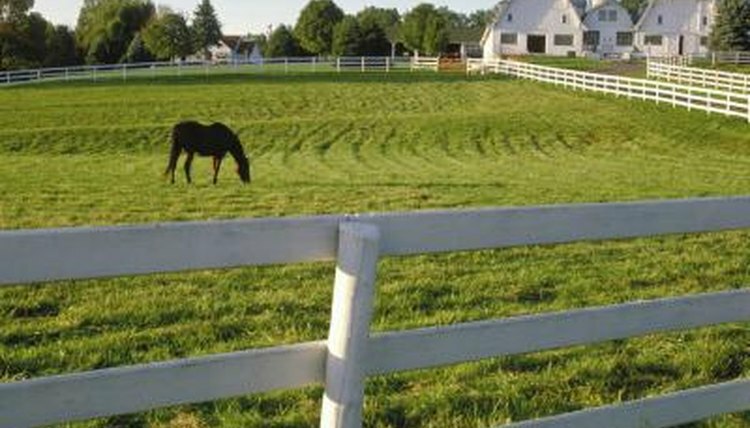 Horses who crib constantly are more common than those who do it on occasion. A cribbing horse's upper incisors wear down much more quickly than those of a non-cribber. The lower incisors can also be affected, though to a lesser degree. His teeth can chip from grasping too hard. As the cribber ages, his front teeth might wear to the point where he can no longer chew food properly. That might mean he has a hard time eating hay, so you'll have to provide him with hay substitutes such as soaked hay cubes and pellets, beet pulp and other feeds mashed to a liquid pulp. The amount of wear depends on what he's cribbing on and how frequently he indulges. In severe cases, the horse could crib so much that his incisors wear down so much that he causes an overbite or an underbite, getting the cheek molars involved. It's difficult if not impossible to cure the determined cribber. Various cribbing straps on the market fit tightly around the neck so the muscles constrict when the horse tries to crib. Cribbing straps help as long as you keep them on all the time. Giving your horse 24/7 turnout, or as much turnout as possible, can also reduce cribbing. You might have to line the upper part of the inside of the fence with an electrified wire to keep the horse from cribbing a post or rail. The hot wire delivers a mild shock when the horse touches it. You can also put a muzzle on your horse that allows him to drink and graze but not grab on to objects. Cribbing could be related to ulcers, so ask your vet about ulcer testing and medication for your horse. You might want to give your horse less grain and more forage in his diet to see if that reduces his cribbing activity. All horses require at least one teeth-floating and general dental care visit annually. A licensed veterinarian/dentist can sedate your horse, if necessary, for a more thorough examination. Your vet can file down the teeth for more even wear, getting rid of sharp points that hurt the horse and make eating or riding painful.